Something similar to "Artist List" view would be extremely useful, but don't see any filtering/sorting options for that view. Is it possible to change the "pivot" field for that view to use composer instead of artist? Apple added the Composers view to iTunes 11.0.2. You have to enable this setting under Preferences > General > "Show Composers". 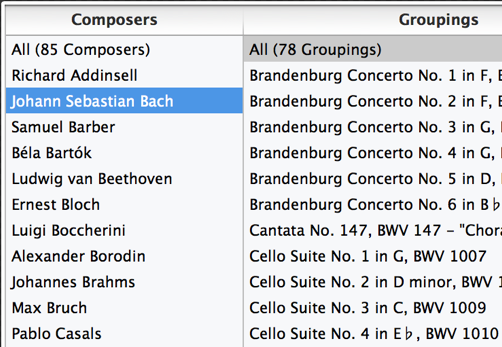 Selecting the Composers tab will display a list similar to the Artists view. To filter the "Artist List" by composer, go to the Artist list, click on the magnifying glass next to the search field and de-select "Search Entire Library", then on that same menu, under "filter by" select Composer. This also works on the Songs list and also filters the Column Browser. If you leave it to "All" it's pretty much the same default functionality of iTunes 10. The closest I can get to your layout is to customize the column browser by control clicking on the existing headings when it is visible. Composers and groupings can be added, although you may want to remove or reorder Artists or Albums if the view becomes too cluttered with columns. Another option but probably not quite what you're looking for. With the Songs header selected, you can go to View > View Options and check Composer and Grouping for them to be columns in the view. You can grab the column header and drag them around to arrange the columns in the order you want. My solution - which is, admittedly a workaround - has always been to put the composer's name in the Artist field. This not only simplifies browsing in iTunes, but also on iOS devices. I have a huge amount of classical music in my iTunes library - about 50,000 tracks currently - and this makes it practical to access music. I really miss the column browser's ability to be visible everywhere, as it was in iTunes 10, as that was my favorite way of drilling down through my iTunes library. There's no way to get the Column Browser back on the left, alas, with iTunes 11. While I didn't use it all the time, some of my playlists were easier to browse with it on the side. How to get the Column Browser in iTunes 11 on the left side? View your rated music, apps and etc. on the iTunes? In iTunes 11, is it possible to show the genre of an album in Artist view? Can I view my iTunes wish list in the browser? List view in Apps section of iTunes?